Gabikyan Karapet. The history of the destruction of Minor Armenia and its great capital of Sebastia / Translation by Knarik Ter-Davtyan. Yer:. Nairi, 2015.-560c. On February 17, 2016, at Matenadaran after Mesrop Mashtots was held the presentation of the Russian translation of Karapet Gabikyan’s book “Yeghernapatum of Sebastia” (translator Knarik Ter-Davtyan). The publication won medals of the Ministry of Culture of the Republic of Armenia and the Committee on Coordination of the events of pan-Russian dedicated to the 100th anniversary of the Armenian Genocide. Knarik Ter-Davtyan is a Doctor of Philology and author of two dozen books. Her works include the study of the monuments of medieval Armenian and texts’ publication and translation of a considerable number of works, searches of study of texts and manuscript. 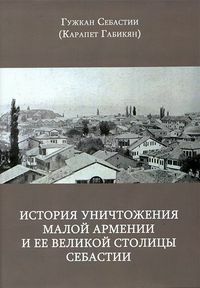 Among the publications, devoted to the 100th anniversary of the Armenian Genocide, features the present extensive volume, which certainly has a fundamental nature and directed to the millions of Russian-speaking public, revealing a large and important segment of the Armenians the monstrously project of Armenia Minor’s people deportation and extermination in all its details. This book can be called memoirs-yeghernapatum, first published in Boston in 1924. The author is Sebastatsi Karapet Gabikyan who is a survivor from Genocide, participant and witness almost all large events described in the 500-page thick volume. Thus, the narrative is valid and reliable. The memoirs of Yeghernapatum Sebastia report exhaustive information about the implementation of the genocide of the population on a large region, largely completing the overall picture of the Armenian Genocide. 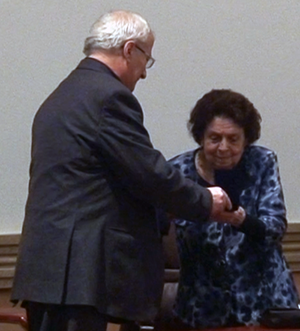 To ensure the implemented high scientific level of translation and publication of Knarik Ter-Davtyan the Ministry of Culture of the Republic of Armenia awarded her "Narekatsi" medal and the director of Matenadaran Hrachya Tamrazyan awarded her "Mesrop Mashtots" medal. The editor of book is Academician Sen Arevshatyan.